The Gak Omek - "Nonrenormalizability"
The Gak Omek is a solo alias for New Jersey native Robert Burger, who started recording under that name in 2000, concurrently with spacerock and eclectic-progressive band Brainstatik. 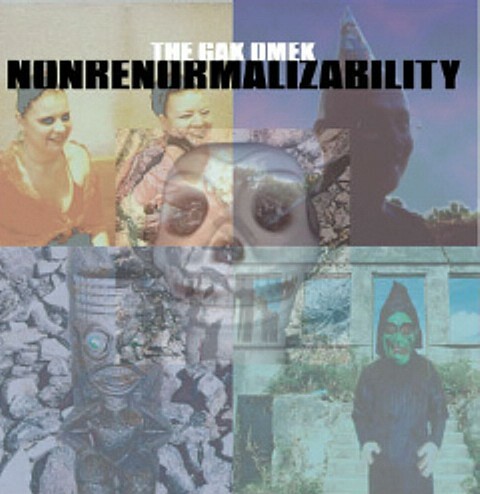 "Nonrenormalizability" is his third album as Gak Omek, following on from 2003's "Alien Eye" and 2004's "Return of the All-Powerful Light Beings". As with those two releases, Burger plays all the instruments on "Nonrenormalizability" - these include not just guitars and guitar-synth, but an array of unlikely-named machines such as octostrimpolizer, bagundochord, flekoscope and yakopod! Likewise, the track titles on this all-instrumental album will have you reaching for the nearest encyclopedia, referencing as they do Siberian meteor impacts, microcompositional retuning tools (as used by Greek mathematicians!) and Galilean galactic star clusters. Unusually in this post-cyberpunk age, "Nonrenormalizability" is an almost universally bright and positive album, with none of the doomy metallic sounds so frequently purveyed in neo-progressive music. The 15 minute title track, for example, makes excellent use of overlaid guitar-synthesizer sounds and electronic percussion to construct something that sounds a bit like, as one reviewer puts it, a happier version of 1980's King Crimson. Likewise "The Tunguska Event" has crazy time signatures reminiscent of Robert Fripp in full-on Frippertronics mode. In contrast to this, "The Pythagorean Lambdoma" (surely a mathrock title if ever there was one) quickly sheds its percussion to transform into what could almost be an electronic string quartet. Even the exceedingly brief interlude "Fifteen Nanoseconds In Hell" sounds less threatening than chaotic, almost like Burger had accidently tripped the switch on his laptop that plays everything all at once. Set-closer "Into the Fourth Dimension" even brings in elements of world music, although the worlds in question could well be extraterrestrial. "Nonrenormalizability" is not an album that rocks or improvises, but rather ticks on with mathematical precision, weaving aural sculptures that are both delicate and intricate - like Brian Eno, Mike Oldfield, the afore-mentioned King Crimson, all playing a never-released soundtrack to Isaac Asimov's "Foundation" series of novels. The bright sounds of science fiction's golden age await those who wish to explore the universe of The Gak Omek.